Industry standard, the ST-1500 is well-suited for a variety of industrial pressure washing applications. 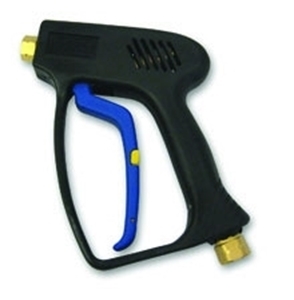 The ST-1500 Weep version gun is our most popular gun for self-service car wash applications. Designed to be “universally” comfortable, even for small hands. Forged brass housing for maximum strength. Unitized valve for easy repair. Stainless steel spring, needle, ball and seat for chemical resistance. Special heat and chemical resistant seals for optimum performance even in the harshest of environments. Fully rebuildable. Convenient six-screw access to cartridge-type valve assembly makes this gun easy to rebuild and a wise long-term investment.